TheRec is a video-capture software for Windows 7 to 10. It uses Microsofts DirectShow libraries to connect to many recording devices, like USB-Webcams, VGA- and HDMI-grabbers, DV-cameras and software screen capture tools. The number of sources that can be recorded is only limited by the power of the PC used for recording. TheRec is not a full-featured capture agent. It does currently not support scheduling and the uploading of media to Opencast is done by the separate software Matterhorn Remote Inbox (MHRI). 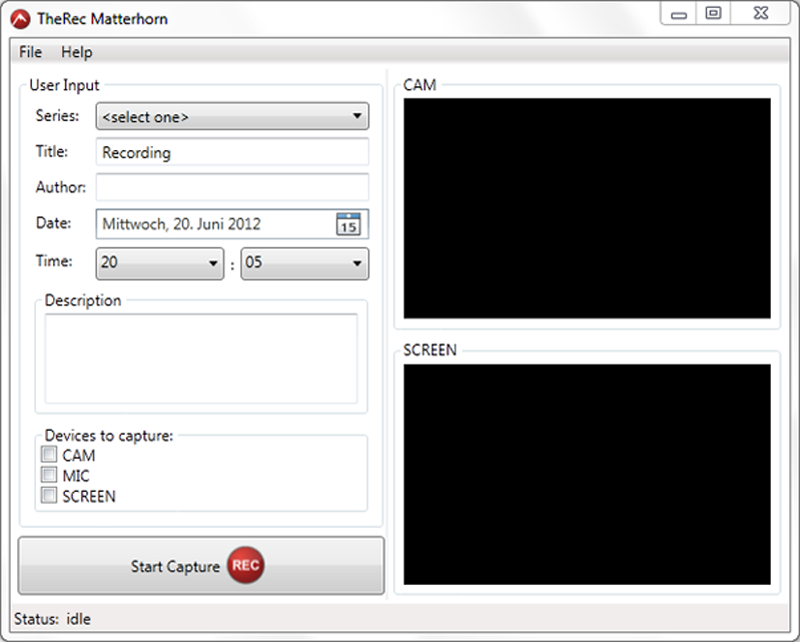 For the recording of the own desktop by software only, we would recommend the free screen-capture-recorder that works quite well with TheRec. The current TheRec 4 version supports recordings with the H.264/AVC video codec. Only free audio codecs are available for licensing issues, so you can use OGG Vorbis or Opus. The H.264 codec provides a large improvement on video quality and file size. New features of TheRec 4 are a pause function, automated stopping after a configureable time and an audio vu-meter. The recording devices can now be configured in more detailed from within TheRec's settings dialog. The lastest version is 4.0.6.2 and was released on October 10, 2016. To download the latest version please provide your name and email adress in the form on the right. You will receive an email with the download-link. To download the latest version please provide your name and email adress below. You will receive an email shortly after with the download-link.